Fulom Face and Body Cleanser rejuvenates the skin through a gentle cleansing process that hydrates and minimizes removal of skin’s natural oils. This is accomplished through use of mild pH adjusted soap agents, humectants (maintains moisture) and organic Fulvic Acid. 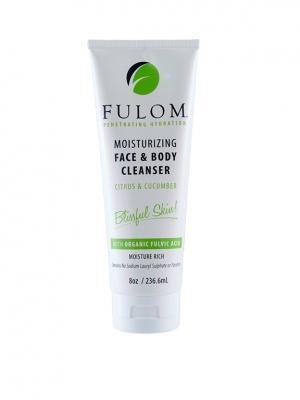 Fulom’s Face Cleanser maintains levels of skin moisture and oil retention, unlike many of today’s harsh cleansers and it was developed for those with skin sensitiviy. It is an ideal cleanser for those with acne, as it strips away the ‘bad’ oils and allows skin pores to receive the moisture and nutrients of Fulvic Acid for repair of damaged skin. It is highly effective at removing makeup and is gentle yet powerful enough to clean even the most soiled skin. Many body washes developed for sensitive skin avoid fragrances because of potential irritation. Our cleanser has a light fragrance that is aromatically refreshing. Disclaimer: Ingredients Contain Citrus Fragrance in the form of “Citrus Aurantium Dulcis” (Orange) Oil. In isolated cases, some individuals do elicit a response to the citrus scent. It is advised to test on a small portion of the skin before applying over larger areas. If you have respond negatively, please contact us and we will issue a full refund. Best applied with a clean damp washcloth for deeper skin cleansing action. Avoid hot water when bathing to minimize removal of natural oils.